Manakulam Vinayagar Temple is an ancient temple of Pondicherry (Puducherry). It is located in the heart of the city, near Aurobindo Ashram. It is one of the popular attractions of Pondicherry. The temple has been in existence even much before the French settlement in Pondicherry. (i.e before 1666). Although modernized with air condition inside the temple, the spirituality of a religious place is well maintained. 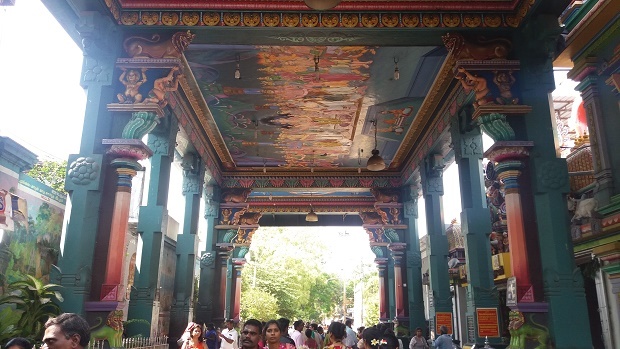 The colourful architecture of the temple is unique. The locals and tourists visit this temple and it is believed that those who visit the temple will be blessed and relieved from their problems. The highlight of the temple is that In the evenings, Lakshmi, the temple elephant will bless the visitors with her trunk. The idol of the Lord Ganesha stands here beautifully, facing towards east, along with his consorts Buddhi and Siddhi. There are many images of Lord Ganesha in different postures in the temple. In the past, during the Portuguese reign, many times they had tried to demolish this Hindu temple, but each time the locals saved it. 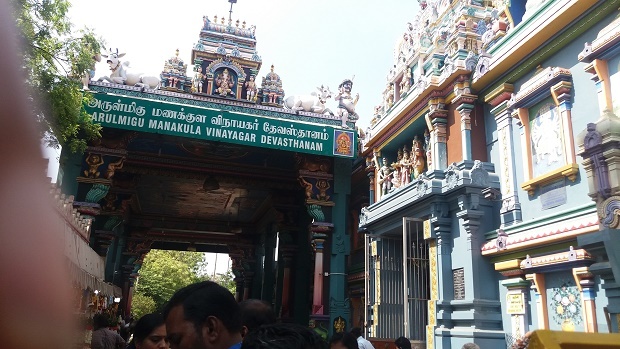 Earlier, the temple was known as Bhavaneshar Ganapathy, but it is now known as Manakulam Vinayagar Temple. For more details please visit the temple website.